EVA Air is the second largest airline based in Taipei, Taiwan, and a five-star carrier. 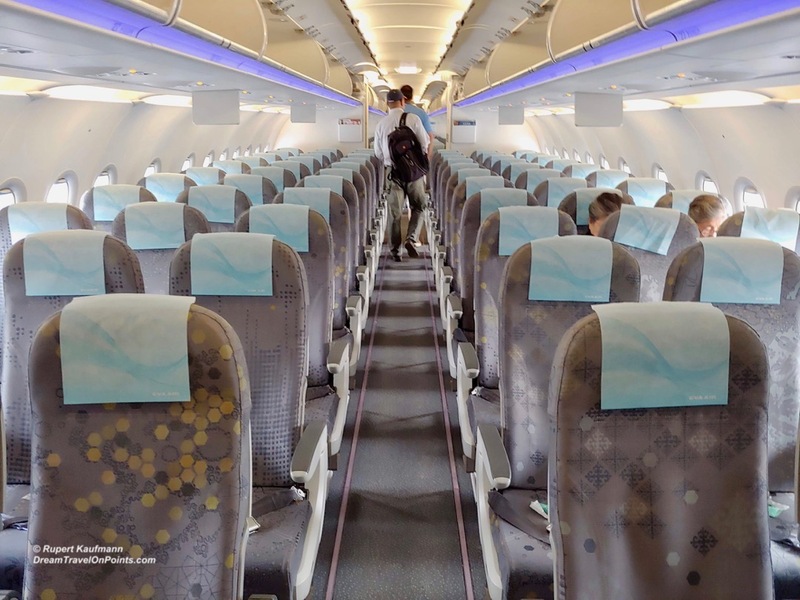 On a recent trip to Taipei, I was able to try out their Economy Cabin on their Airbus A321. The service and food were excellent, as you’d expect from a 5-star airline, delivering a better flight experience than regional competitors. 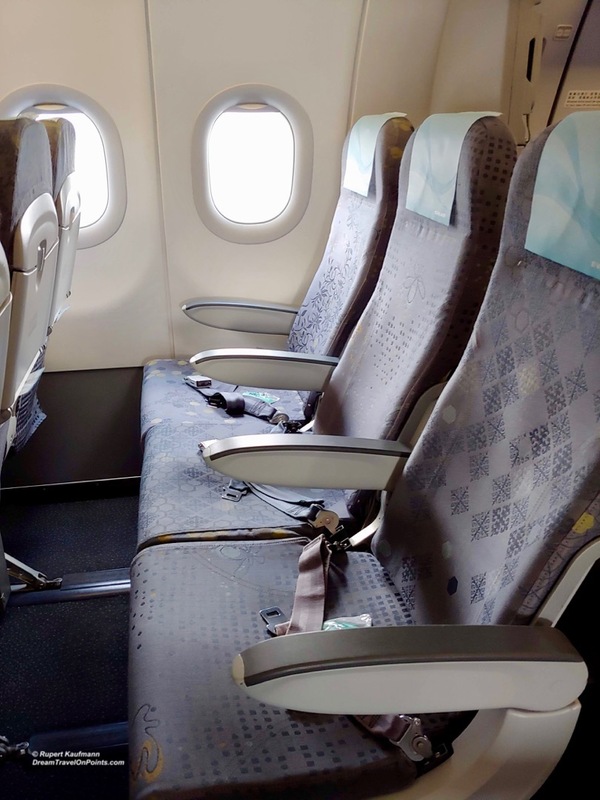 But be aware of the plane on your route – the cabin and seat on the A321 are just average and the entertainment options are very limited! Pre-Departure: I booked my flight on EVA online and it was easy enough. I was able to check-in online, but oddly, EVA had re-assigned my seat without notification, from an exit row to a regular seat. Check-in staff was not able or willing to return me to my previous seat. On this short flight from Taipei to Manila, EVA allows 30kg of checked luggage in Economy, as well as an additional 20kg for StarAlliance Gold members. Carry-on luggage is limited to a standard-size item up to 7kg and a personal item without weight limit. That’s rather restrictive for carry-on, as many empty rollaboards will weigh 3-5kg empty, but my carry-on wasn’t weighed at check-in and gate staff didn’t appear to weigh it either. As a StarAlliance Gold member I received a lounge invitation with my boarding pass printout – I like when airlines make it that easy. EVA has four lounges at Taipei International, with one under renovation, one for their own Infinity Diamond members, one for Business Class passengers and one for StarAlliance and their own Gold members. You can read my review here! The boarding process was well organized and orderly, with premium cabin and elite customers boarding first and everybody else following quickly after. That friendliness continued throughout the flight. 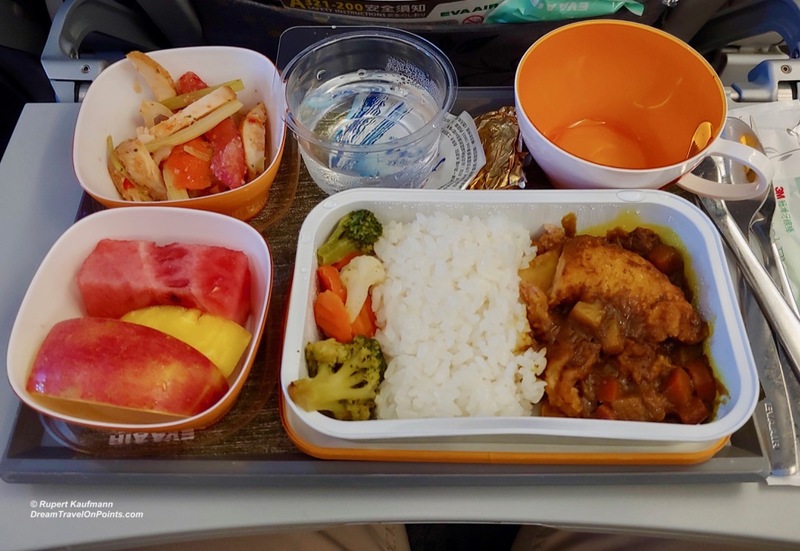 On this short 2h flight, they served a full meal on a tray, with fresh fruit, a salad and a hot entree – I picked the chicken with rice and vegetables, which was pretty good, as well as a up of water. Flight attendants also serve a limited selection of drinks with the meal, including soft drinks, wine & beer. The meal is significantly better than what Cathay Pacific serves on similar flights and comparable to Singapore Airlines or Thai Airways! Seat Airbus A321 (2 class): While EVA Air flies mostly wide-body planes, this route is served by their smallest plane, An Airbus A321. The 3-3 layout is pretty standard and the decor in light beige/brown tones is friendly enough. The legroom is limited at 31-32in, but ok for a regional flight. The seat padding is thin and there is no adjustable headrest. The recline is minimal. 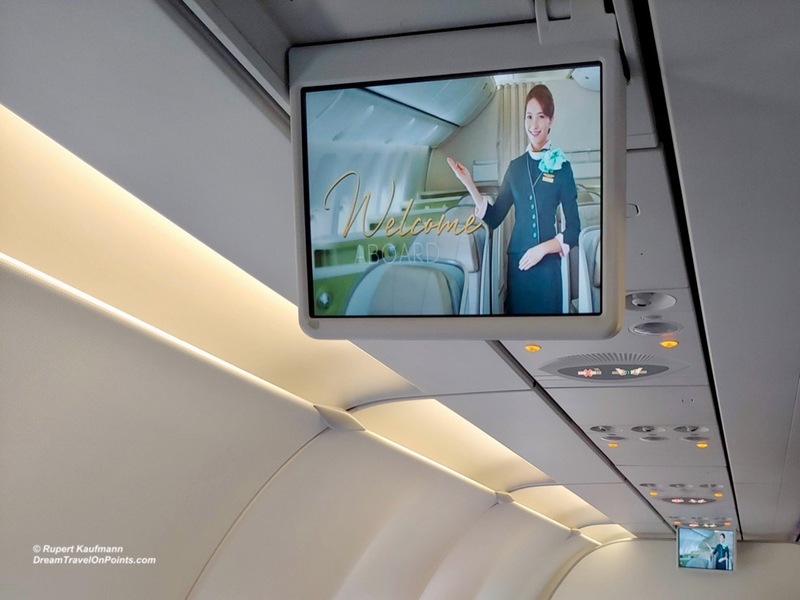 My biggest gripe is that the A321 does not feature personal video screens in the seatbacks. which the larger planes all have, only screens that deploy from the ceiling. The bathrooms on the A321 are standard size and were kept very clean throughout the flight. 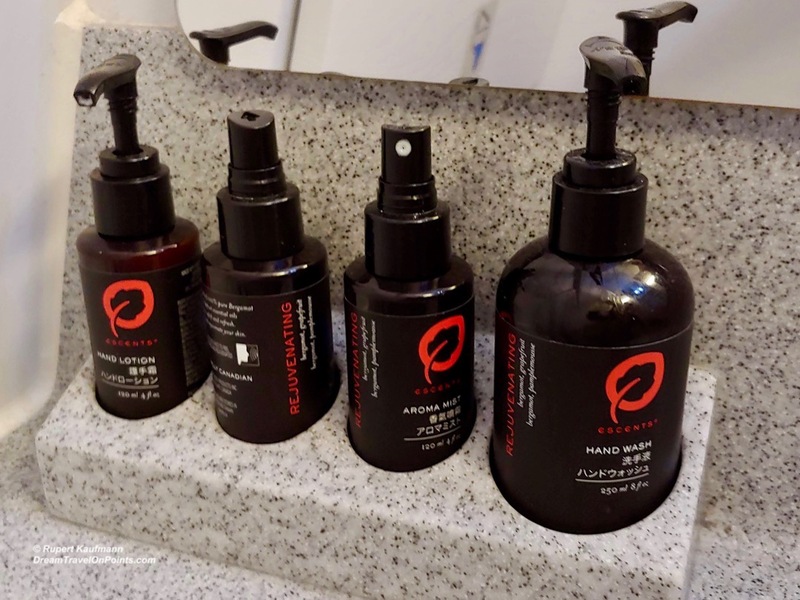 EVA Air uses high-quality toiletries that were much nicer than what you’ll typically find in economy class! Entertainment: Small video screens will flip down from the ceiling for the safety video, but there was no program played on our short flight. The A321 doesn’t have onboard WiFi or streaming to your personal devices.These limited entertainment options are ok for a 2h flight, but I wouldn’t be stuck there for longer. I wish EVA as a five-star airline would have a more consistent Economy offering across their fleet, like Singapore Airlines, and offer video screens with access to their full movie and TV library on all their planes. Bottomline: EVA Air offers fantastic service on par with other 5-star airlines like Singapore Airlines and ANA and very good food. The experience is a significant difference to US airlines, or regional second-tier airlines like Malaysia Air or regional LCC. If you are planning a long-haul trip, I’d recommend to seek out EVA Air, their five-star rating is well earned, even in Economy! The ground service was just ok and the hard-product and entertainment on their A321 was a disappointment. 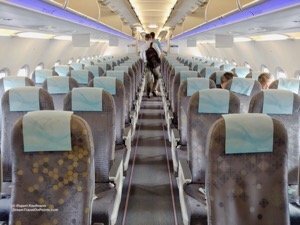 While still a nice step up from an LCC, the A321 Economy cabin doesn’t deserve 5 stars. 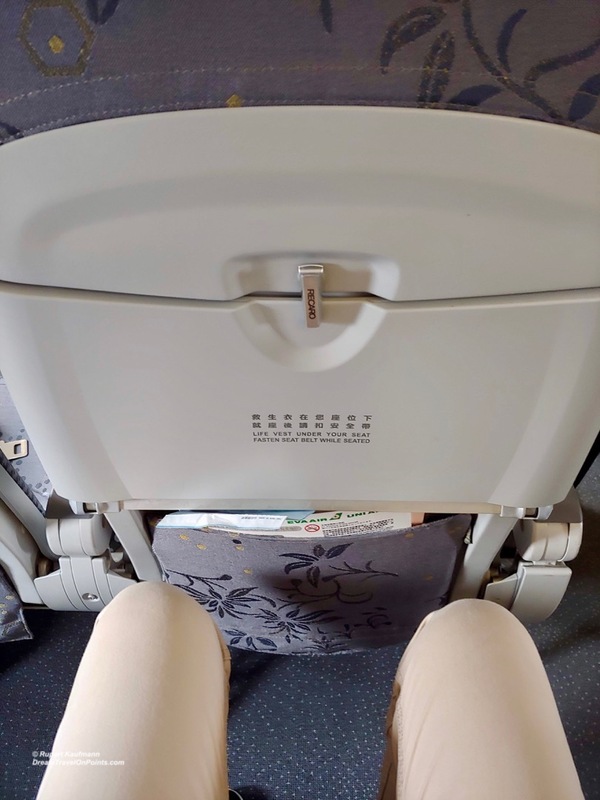 If you have a chance to fly EVA Air, check the plane serving your route carefully – I’d highly recommend EVA Air with their wide-body Boeing B777 and Airbus A330, but would be a lot less willing to pay a premium on their A321!